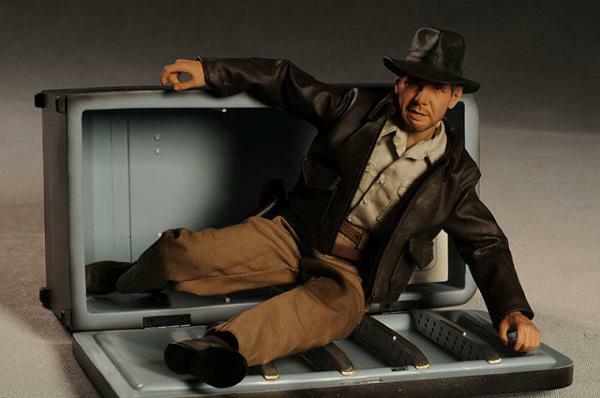 In 2019, a new Indiana Jones movie will hit theaters, directed by Steven Spielberg and starring Harrison Ford as the adventurous archaeologist who plunders ancient cultures with a style that would make Lara Croft jealous. This is odd news, considering the last movie in the franchise was so terrible that people began to describe all failed sequels as "nuking the fridge" in reference to a particularly awful scene where Indy survives a nuclear blast inside an old refrigerator. The new movie was announced today with a brief comment from Disney Studios Chairman Alan Horn: “Indiana Jones is one of the greatest heroes in cinematic history, and we can’t wait to bring him back to the screen in 2019. It’s rare to have such a perfect combination of director, producers, actor and role, and we couldn’t be more excited to embark on this adventure with Harrison and Steven.” The announcement also said that the four previous films "have brought in nearly $2 billion at the global box office," which might help explain why everybody is "embarking on this adventure." Missing from the announcement is Shia La Beouf, who co-starred with Ford in Indiana Jones and the Crystal Skull and was for a while considered to be the heir apparent to the franchise. Ford is presumably going to carry this film, which raises a lot of questions. Though the actor still has the gravitas and humor required for the role, it's hard to imagine a senior Indy running around in classic adventure movie style. It's likely that the studio will want to pair him with a younger star or stars to round out the story. Another interesting question is whether this movie will give us an adventure set after the events of Crystal Skull or if it will be a flashback to some earlier adventure. If we move forward in time, we're looking at a movie set in the 1960s or possibly the '70s, which could be fun. At last, Indy will have some high-tech gadgets! But if it's a flashback, Ford can join us for a frame story where he looks back on the 1930s, when Raiders of the Lost Ark took place. That would be a great opportunity to tell a story about a scrappy scientist fighting fascists—and leave a spot open for a younger actor to take on the role of Indiana Jones. Either way, fans are bound to look upon this announcement with as much trepidation as hope. Of course we want to see Spielberg and Ford back together, but maybe not like this.